Today its a nine hour bus ride to Luang Prabang. 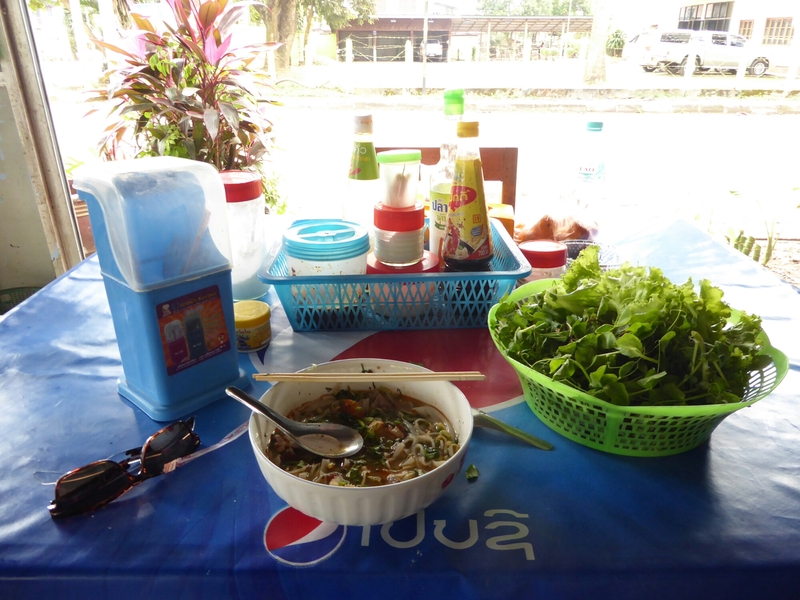 We get picked up at 8am at our hostel by a songthaew which is a small pickup with two benches in the back. It drives 20 metres round a corner and we park up and wait for 20 minutes. If you think that sounds frustrating, travel in Asia may not be for you! The person we are waiting for does not show up so we continue to the bus station where we are dropped near our mini van. Unfortunately for us, it is already full of locals so we are left with the back seats. 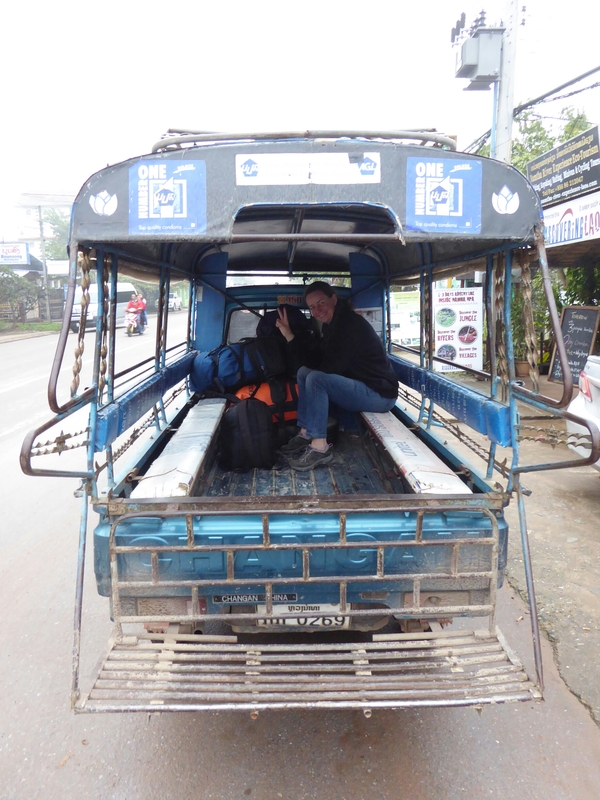 As a kid, the back seat was cool, the place to sit, but with nine hours of potholed Laos roads ahead, it fills me with dread. The journey starts well though with Ronan Keating crooning “you say it best when you say nothing at all” a phrase well quoted in the Roberts household, especially at the end of minor disagreements. This is a false impression of what is to come though, a brief moment of happiness before we are turned into squash balls and bounced and thrown around the inside of the van. The roads are bad and following the rain, very muddy. We go through villages of bamboo huts with palm leaf roofing. It looks idyllic but it is for me, an unimaginable life. We turn onto a bigger road which is smoother and we bounce less. Toilet stops come and go and soon we stop for lunch over-looking a valley. We don’t eat but look at a selection of caged animals. Our non eating bus mates feed two monkeys some bananas but only after a degree of teasing which they enjoy. The afternoon is spent being thrown from side to side as we twist along mountain roads with beautiful views down tropical valleys. It may be some of the best scenery we have seen on this trip. 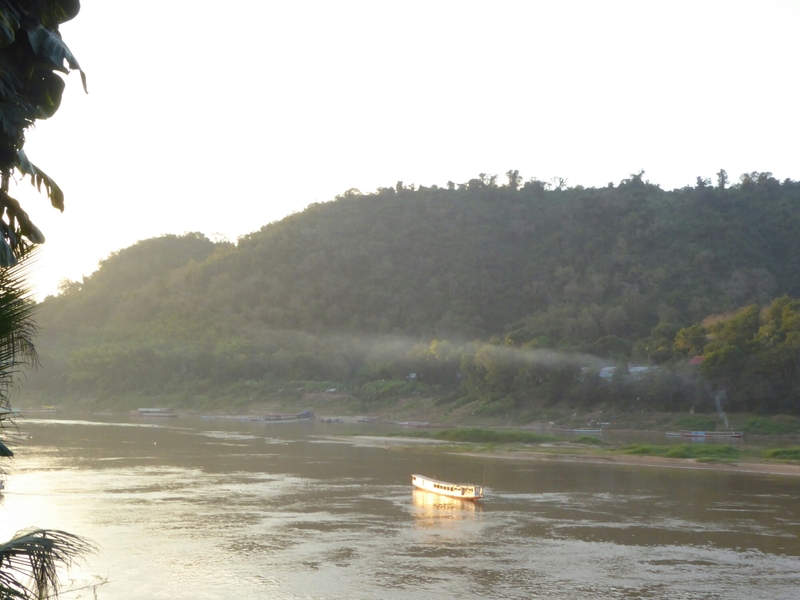 It’s heavenly and then improves as we join the Mekong which we follow into Luang Prabang. Buildings become more frequent, traffic thickens, the roads get dustier and we arrive at the southern bus station in only eight hours. As we disembark and gather our bags a songthaew reverses up to us and we are soon on our way past French colonial buildings, through leafy, laid back streets where cafes, restaurants, spas, and boutique ethnic clothes shops soak up the last of the fading sunlight. 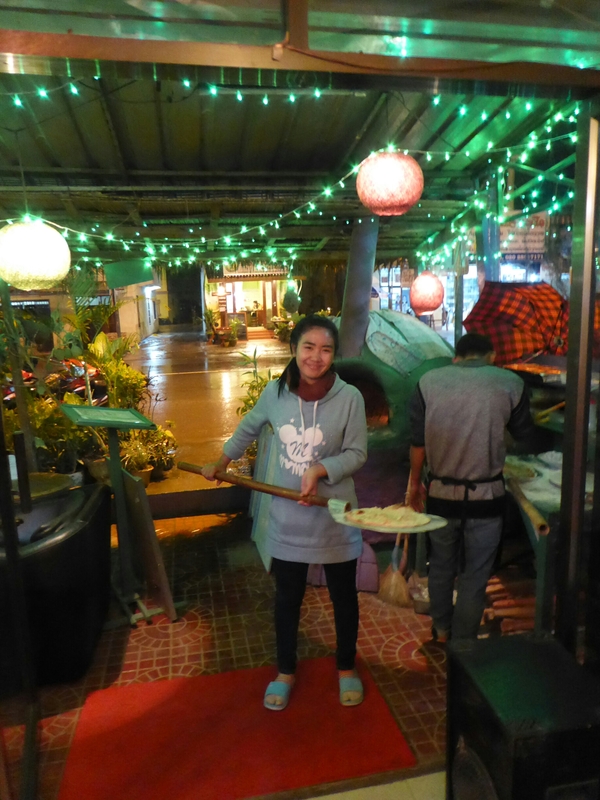 We have gone up a level in the numbers of westerners too and there are young travellers, middle aged families and elderly tourists all enjoying the delightful Laos city. 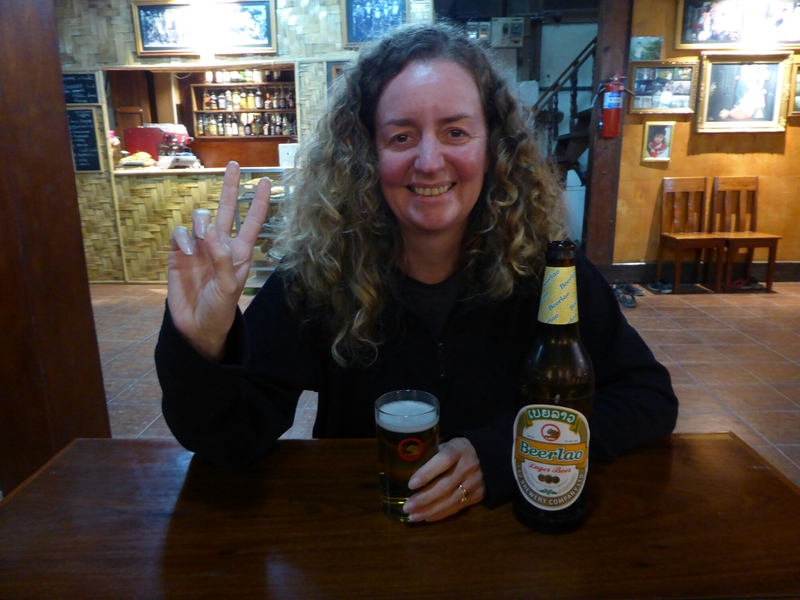 No one is at the hostel, so a lad from the hotel next door checks us in and after a humid walk round the block and a thirst quenching cold beerlao we return to pay the hostel owner. 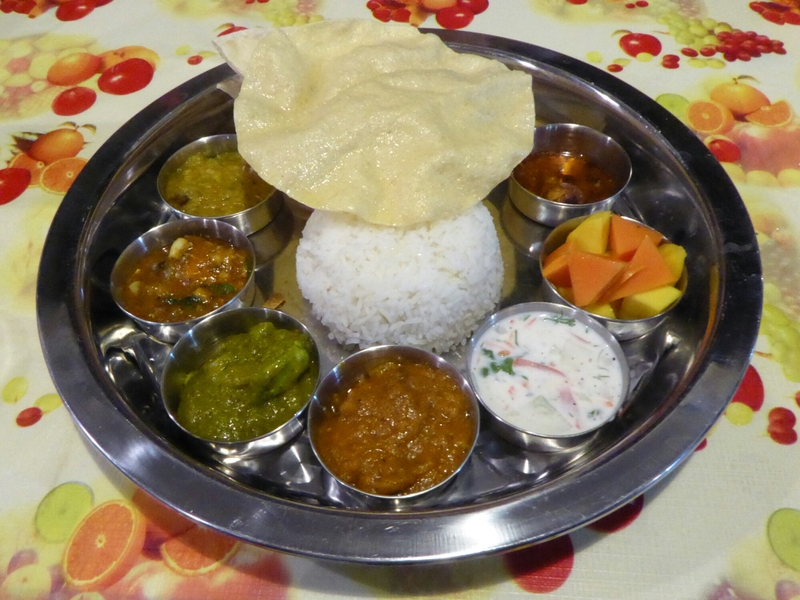 Tea is an Indian curry accompanied by cold beerlao at a restaurant overlooking the Mekong. Its a great moment in a trip of many. 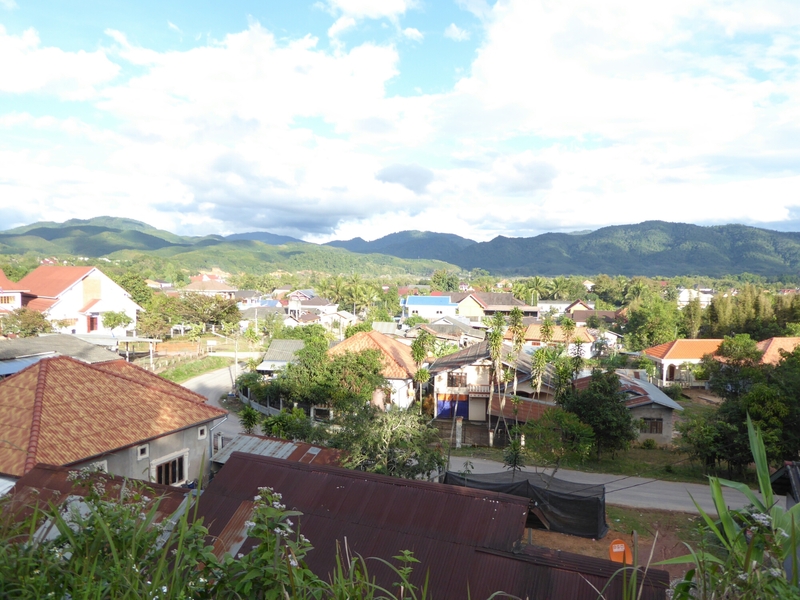 We were very happy that we got a inexpensive, nice room with an en-suite in the sleepy northern Laos town. We spent four days coughing, sneezing, sweating and instead of tourism, lying in the room. Its rained a lot too. The many local restaurants and cafes have supplied us with vegtables and rice and the BBC iPlayer has kindly supplied entertainment. I have continued to shout at my phone who can play chess better than I can. We both feel a bit sad that we haven’t explored this laid back, friendly place but you can’t choose where you are ill.
After four months on the road, today we head to Laos in South East Asia, where we plan to spend the winter months. 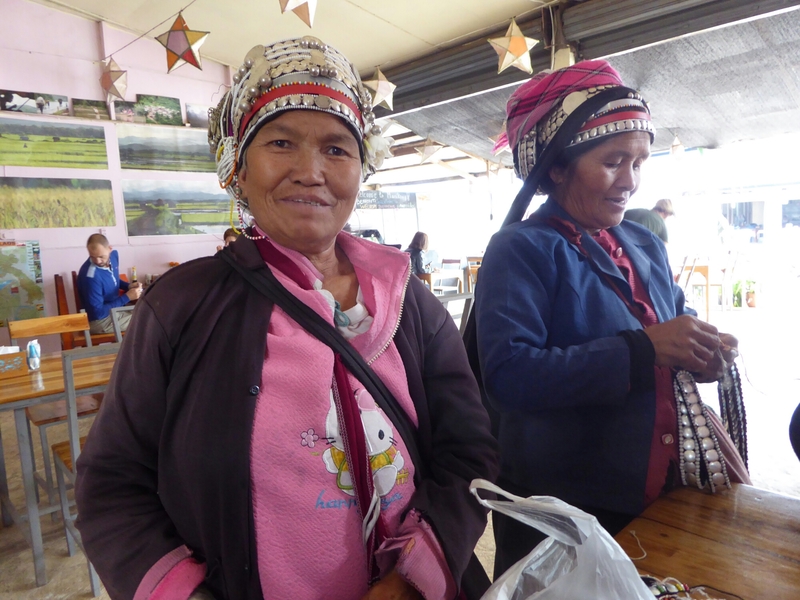 This morning we realised we could meet gap year travellers born in the year we last visited Laos, eighteen years ago. Ouch! 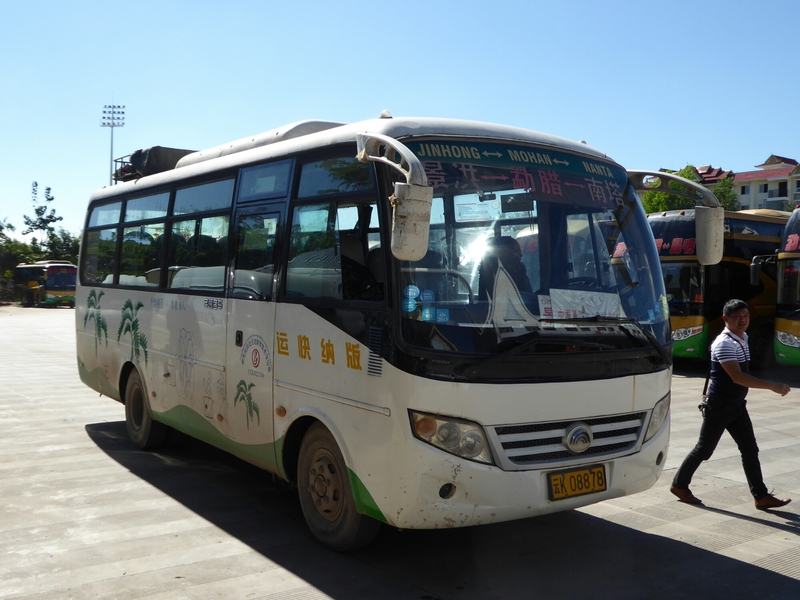 Our seven hour journey starts at JingHong southern bus station on the 11 o’clock. The bus looks tired with broken seats, curtains and cobwebs which we don’t mind but a group of young Laos tourists don’t like at all and they hold their noses as they board. 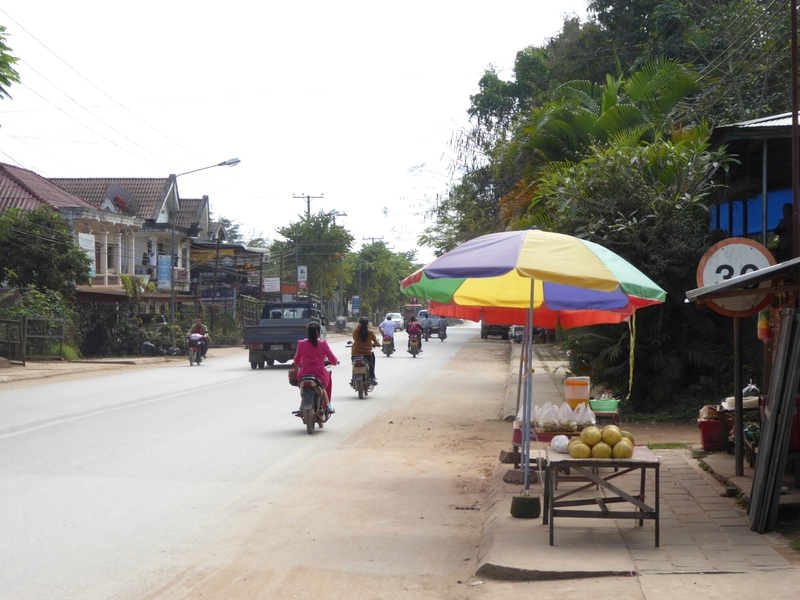 We drive through the delightful JingHong set on the Mekong and begin the steep ascent out of the city. After about 15 minutes a car drives past and shouts at our driver who pulls over. The car stops too and a man gets out and shouts at us before driving off. A commotion starts on the bus. The drivers mate darts out of the door followed by one of the Laos lads and I follow to see them closing the boot. The drivers mate runs off down the hill and we get back on the bus which turns around and heads back down the hill. The other passengers are stood scanning the road and I can only assume the boot was open and our luggage is strewn over the road. We catch up with the drivers mate who gets back on and we continue down the steep hill. Everyone is shouting and looking out of the windows. We have a conversation about what we would miss the most and secretly, I think Al dreams of a new wardrobe. After 10 minutes we turn around, head back up the hill and pull over at the place where we first stopped. We all pile out and check the boot and there is only one sad gap in the middle of the luggage, where a suitcase belonging to one of the Laos lads used to sit. I feel really sorry for him but he doesn’t seem bothered at all. The girls in his party do all of the negotiations with the drivers mate. We carry on through pretty valleys on a road so new its still being built. Concrete works scar the landscape and aggregate and tarmac trucks slow our progress on hills. We go through many tunnels, one that is four kilometres long and so thick with dust that fog lights just make the dust storm seem pretty. In this tunnel, on a bend, we overtake a truck. We get diverted through thick mud, follow a truck that is emitting plumes of smoke from his engine, stop in the middle of nowhere to pick up passengers and nearly slam into a truck stopped for repairs on a hairpin bend. 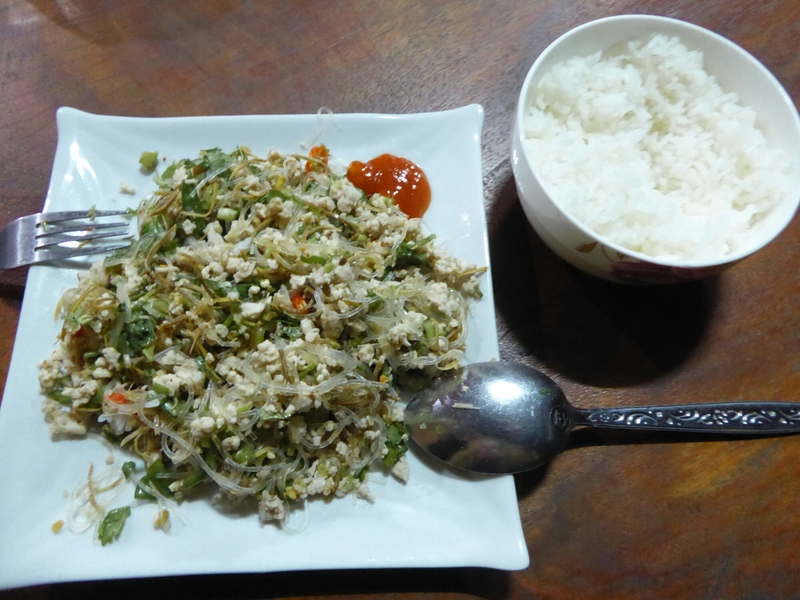 At about 3pm we stop for food at Mengla. The drivers mate tells us we can’t wait on the bus but we have to go into the bus terminal, through security and wait in the departure lounge for 20 minutes. We go through and see the bus drive away. Forty minutes later the bus returns and all our bags are on the back seats. There are bunches of vegetables in the overhead compartments, under the seats and presumably in the boot. A form is passed around and we have to complete name, nationality, gender and passport number. There are twelve of us on the bus and we are the only westerners. The drivers mate isn’t happy and we have to fill it in again as some people had done it incorrectly. We arrive at Mohan, the Chinese border town where feral dogs with broken paws run across the road. We stop and are immediately boarded by about five money changers. We get offered a poor rate but haggle and are happy with the outcome. We walk with our hand luggage into Chinese immigration where we complete a departure card and get our exit stamp. 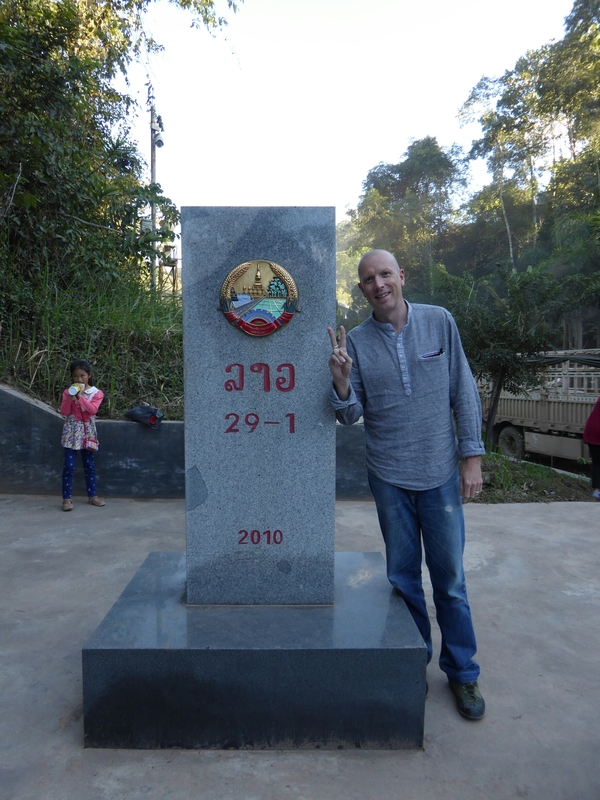 We walk through no mans land to the Laos/China border marker for the obligatory photo then onto Laos immigration. At the Visa on arrival desk we pick up two forms to complete and hand them back with a passport photo and $70 and our visa is quickly printed into our passport. We queue at the desk for our stamp for 30 days entry and we only take slightly longer than our Laos bus mates who are waiting by the bus outside the immigration building. It has taken no time at all though, as we have gained an hour. The whole enormity of China uses one time zone and so Laos is an hour behind. 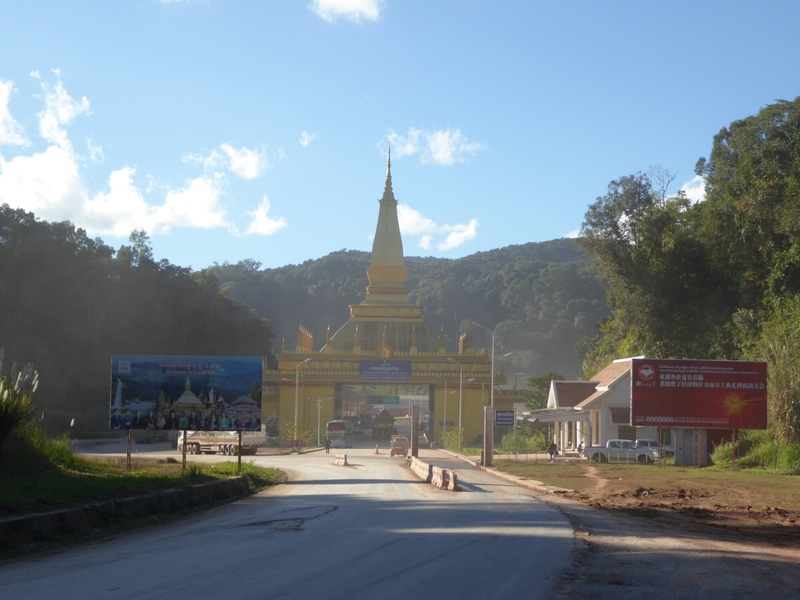 At 4.30 we drive into Laos! At 4.40 we stop at the customs building where the driver and his mate get off but only 10 minutes later we’re through! At no point have our rucksacks left the bus or been checked. 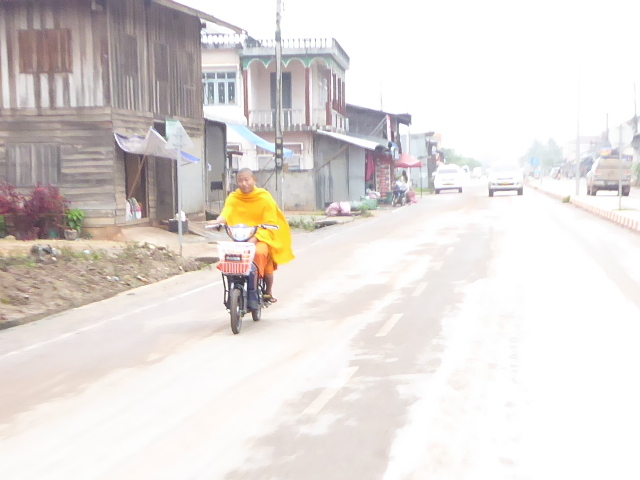 The roads on the Laos side are not as complete and progress is slower. We wait at one point for a giant roller to compact dirt before we drive over it. The bumpy road twists through low green hills and the sun drops adding an orange tinge. We pass small villages of wooden huts where kids chase after chickens in scenes very different from those we saw on the other side of the border. There is a sign for a golden triangle checkpoint which tourists were discouraged from visiting eighteen years ago. 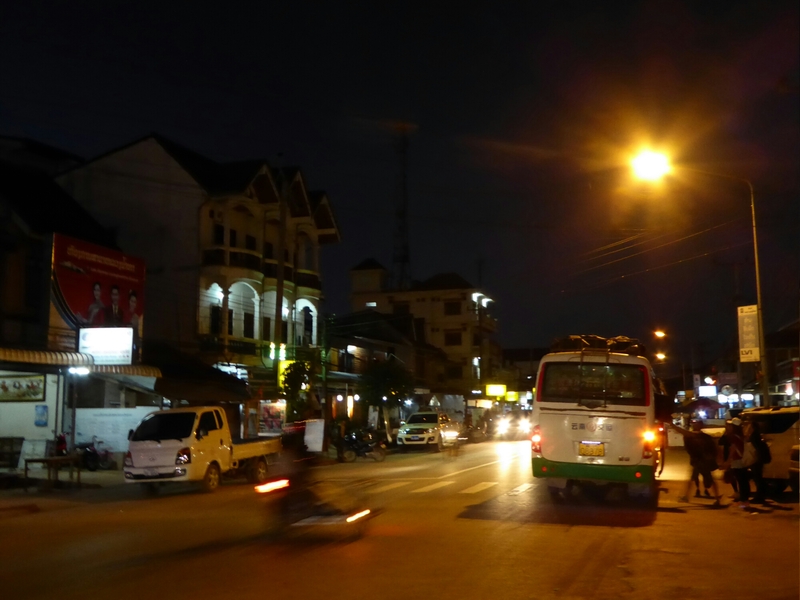 At 7pm we arrive in Luang Namtha, only 2 hours late and we’re dropped at our hostel. Our rucksacks are passed through the bus window. The hostel recommend a place to eat and although we are both tired and ill, we have to toast our return to a country we loved so much.